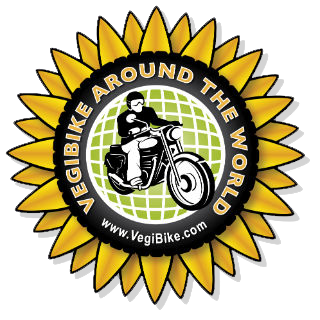 VegiBike, veg oil and diesel fueled engine, classic Royal Enfield motorbike by Harry Lyon-Smith: 24th/25th June. 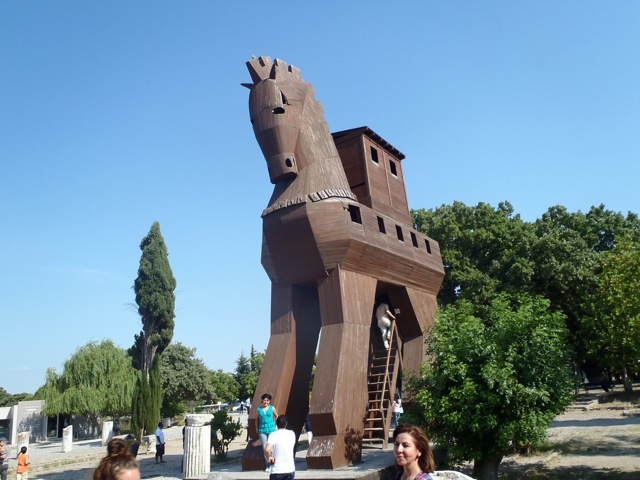 Greece/Turkey. Stuck to the motorway to the border. It was about 250 miles and very light traffic. I wanted to push on and get into Asia. I had not particularly thought about Greece in terms of expectation of experience, it was a country to cross on the way to Eastern promise. Funnily enough I have enjoyed the country and it's people a great deal. Nothing but friendliness and generosity. The roads are a dream, mixing exciting scenery, very little traffic and generally good repair. That said I did have one hairy moment on the first day, when the road suddenly narrowed because of a landslip. The right hand side of the road was an unguarded precipice of hundreds of feet and the on coming car only gave me inches to squeeze between it and the said cliff face. Both Batty and I did a cartoon type breathing in act to make it. This was my first border crossing of any consequence. Of course I completely forgot all the stuff I had been reading up on and made a bit of a meal of it. After about an hour of to-ing and fro-ing, being sent from one kiosk to another, accompanied by insanely loud piped Turkish music, I was in the land with the red flag with stars and a young moon. Staying in Gallipoli in a somewhat suspect hotel, but with a great proprietor who has helped get road maps and a fine diner. It is difficult when in a place that nearly a hundred years ago were the fields of huge loss of life, of extraordinary suffering and bravery, to know as where or what to see. I decided to just drive around the peninsular that saw much of the fighting and stopped at the most southern point, where there is a huge commonwealth memorial. 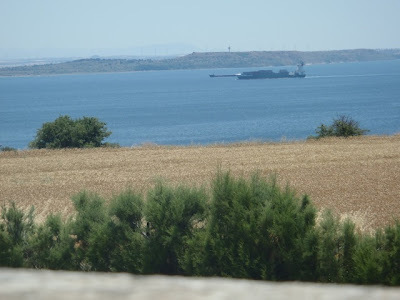 I ferried across the Dardanelles to Asia, and you can see why it was so strategic. This stretch of water that took about 10 mins to cross, connects 2 economic and political worlds. 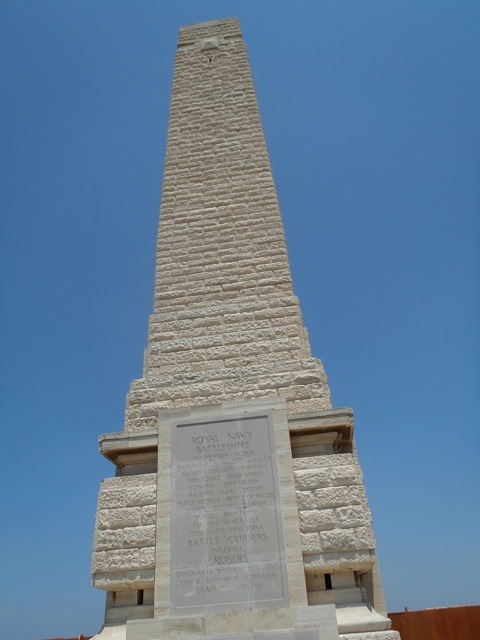 Had Churchill and his fellow planners succeeded in beating the Turks it would have changed the shape of the war enormously. 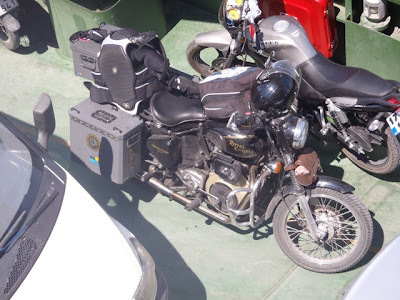 Batty on the ferry across the Dardanelles, her 3rd time on water, she has quite got her sea wheels. In the later afternoon I went to Troy. Although ruins, it again was positioned very strategically as a trading post/ harbour for ships that could then only sail with the wind. 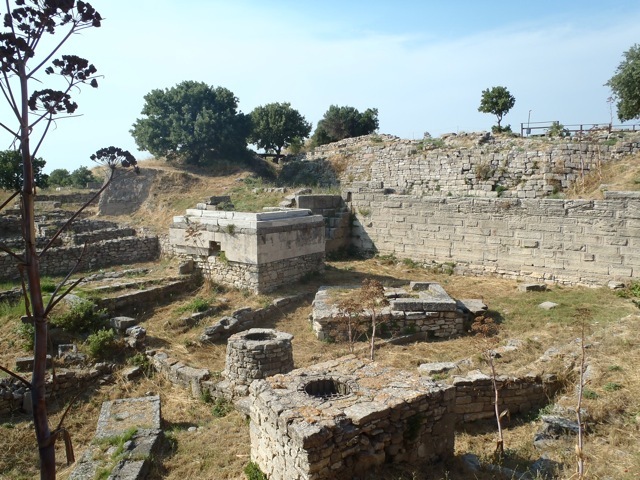 As the prevailing wind is from the north, ships had to wait a long time at Troy for the southerly wind. 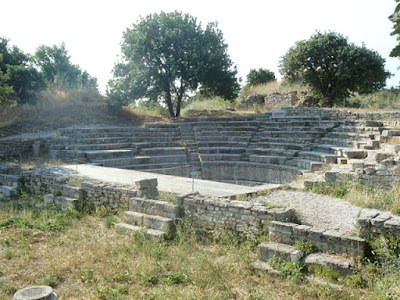 This caused trouble as the Greeks and then the Romans wanted to lay their hands on it.. I had a good look around for Helen, but alas not even a glimmer. Horror of horror, I suppose they have to for the kids? 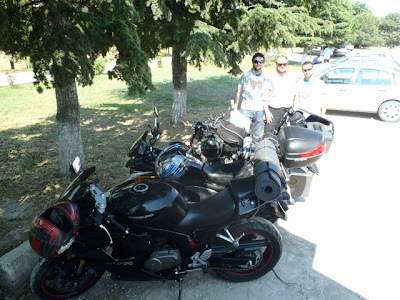 Some fellow bikers, every friendly and spoke great English (please say hello here if you read this blog, I am afraid I did not catch your names). Thank you and hello again Erdem and Cihan, it was great to meet you and good luck in India and your studies. Hi Harry, you are certainly cracking on - well done indeed! Interesting reflections on Gallipoli and the strategic landscape - really brings it alive. Hope the CC turns up. You are starting to feel like a long way away now. Bit weird. Pleasure to keep reading about your travels. Hi Harry don't try to go too far each day! 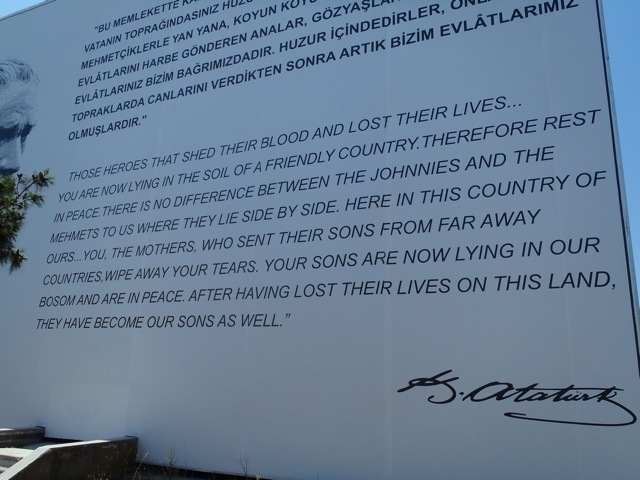 The Gallipoli memorial inscription is quite famous I think: I don't think it was from a "grieving mother" as it is signed by Kemal Ataturk who was keen to westernised Turkey and heal wounds with the past. He made the Turks stop using Arabic script and change to Latin-style lettering to "Europeanise" them: must have been pretty traumatic for the few who could read and write! Thanks Hamish, you are right as ever, and have corrected the quote attribution. I had miss read something. Very nice to see that you're updating this blog frequently. I'm following your trip from the beggining. Where are you planning to cross from Turkey to India? Great to hear of your progress and glad to hear you survived the egg attack ! Can you get me the artwork so that I can do you a VegiBike T-shirt for your travels ? Thanks for your support and following. I can't promise to be as regular...it rather depends on wifi access etc. The plan is to cross through Iran via Turkish border and then to Dubai. Airfreighting from there to Napal and then into India that way. this was a great post and fascinating, good to see Batty looking in good shape, your blog is something to look forward every other day when i log on to see where you are...have fun in Turkey. good to see you are making good progress. We at the Kent science park are following your adventure. Neptune's Revenge. 22/23 June, Paralia, Greece.